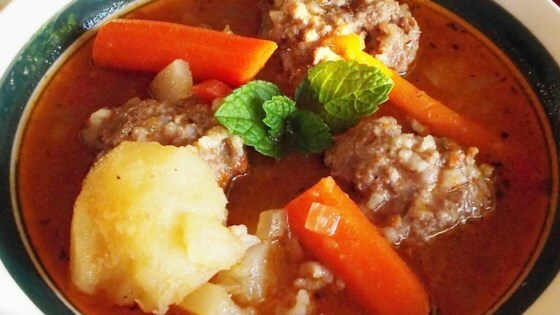 "Lean ground sirloin meatballs in tomato broth with rice and a touch of mint." In a large stock pot, cook onion and garlic in olive oil over medium high heat until translucent. Stir in tomato sauce, water, rice, mint, and salt, and bring to a low boil. Meanwhile, combine ground sirloin with tomatoes, 2 tablespoons diced onion, egg white, mint, and salt and pepper. Form into small balls, and place in boiling liquid. Reduce to a simmer, cover, and cook for 30 minutes, or until meat is cooked and rice is tender. This classic Mexican meatball soup is surprisingly simple to make. Just like my sweet grandma always made for us as children. the mint is most definatly the secret that makes all the difference. I would say use as much or little as you wish. This is a great recipe. Add some lemon or lime juice to the soup when eating it and warm some corn tortilla's and hot sauce (Tapatio is my fav). You will not be disappointed. Such a family friendly comfort food. Unfortunately it was a little on the bland side for the adults . . . the kid loved it.